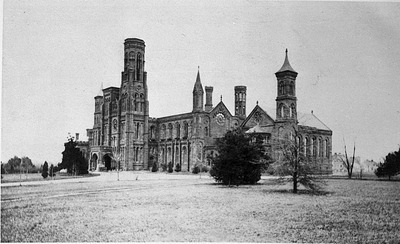 January 24, 1865, was designated “an epoch in the history of the [Smithsonian] Inst[itution]” by Joseph Henry, first Secretary of the Smithsonian. 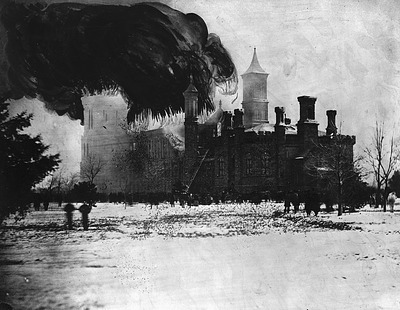 On that afternoon, one hundred and forty-seven years ago today, a large fire erupted in the Smithsonian Institution Building, or “Castle,” destroying multiple sections of the building and their collections. Though Henry had chosen to keep costs down during the Castle’s initial construction from 1847–1855 by only fire-proofing some areas, he did enforce some precautions to prevent a fire: he prohibited smoking and the carrying of exposed flames, maintained a night watch, and stationed buckets of water around the building. Despite these safeguards, a fire started between the ceiling and roof of the main hall when workmen in the second floor Picture Gallery accidentally inserted a stove pipe into the brick lining of the building instead of into a flue. The fire kindled for some days and grew too large to stop before it was discovered. Henry was writing in his office on the second floor when he heard “an unusual noise about my head […] in the form of crackling,” and he quickly realized that the building was on fire. William DeBeust, a maintenance worker in the Castle, sounded the fire alarm and rushed to save some of the portraits in the Picture Gallery. The fire drew many spectators, who watched as it rapidly engulfed the building, caving in the roof of the main hall and destroying much of the second floor and south tower. 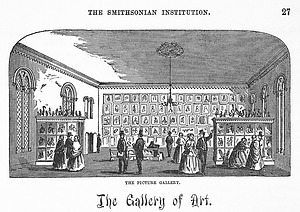 The lecture hall, apparatus room, Board of Regent’s room, Secretary’s office, and Picture Gallery burned, along with much of their contents: all but seven Native American portraits by John Mix Stanley were lost in the Picture Gallery, most of the official Institutional papers burned in Henry’s office, and the personal effects of founder James Smithson burned in the Regent’s room. Mary Henry, the eldest daughter of Joseph Henry who lived in the Castle with her family at the time, described the ferocity of the fire in her diary and regretted that “in the space of an hour was thus destroyed the labor of years.” Joseph Henry appraised the damage and mourned the great losses, but was thankful that due “to the fire-proofing the Museum and Library have been saved.” Henry recognized a silver-lining in the midst of the disaster: “The accident though much to be lamented will I think in the end be of advantage to the Institution. So long as the building was covered with a wooden roof and the wings liable to destruction from fire the property contained in it was not safe.” A temporary roof was fitted over the building by the military on January 28 until reconstruction began in the spring of 1867, when a new permanent roof was raised, this time built from fire-proof materials. The 1865 disaster was not the only fire in the Smithsonian’s history. Look out for another post in a few weeks that will highlight another fire and how the Smithsonian and other institutions can work to prevent such accidents.